Yesterday’s elections brought a widespread win for the Republican Party, which will increase its share of seats in the House in the next Congress, and take over the Senate, with a net gain of at least seven seats. Nationally, 52% of voters backed Republican candidates for Congress, while 47% voted for Democrats, according to exit polls by the National Election Pool, as reported by The New York Times. The overall vote share is similar to the GOP’s margin in the 2010 elections, and many of the key demographic divides seen in that election — particularly wide gender and age gaps — remain. Men favored Republicans by a 16-point margin (57% voted for the GOP, 41% for Democrats) yesterday, while women voted for Democratic candidates by a four-point margin (51% to 47%). This gender gap is at least as large as in 2010: In that election men voted for Republicans by a 14-point margin while women were nearly evenly split, opting for GOP candidates by a one-point margin. And well-known generational divides were again in evidence in Tuesday’s election. Young voters have been the Democratic Party’s strongest supporters over the last decade, as they were again yesterday, while Republicans fared best among older voters. But — as in 2010 — an older electorate compared with presidential elections advantaged the GOP. 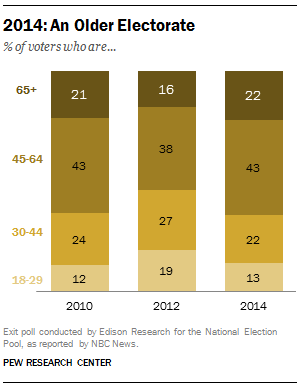 Fully 22% of 2014 voters were 65 and older — a group GOP candidates won by 16-points. By comparison, in 2012, they made up just 16% of the electorate. And even though Democratic candidates won the 18- to 29- year-old vote by an 11-point margin, 54% to 43%, this group didn’t carry the same weight as it did two years ago when Barack Obama was re-elected. They made up a much smaller share of the electorate than in 2012, and the Democratic margins among this group also were not as large as in 2012. According to the exit polls, voters younger than 30 were just 13% of those who showed up at the polls. Though this is little different than the 12% they represented in 2010, younger voters accounted for a larger share (19%) of the 2012 electorate. And among 30- to 44- year-olds this year, 50% voted for Democrats while 48% for Republicans, but just 22% of yesterday’s voters were in this age range, while 27% of voters were in this age group two years ago. The age gap in voting preferences, after first emerging in 2004 and 2006, became a major factor in 2008 and has remained substantial in each of the last four election cycles. 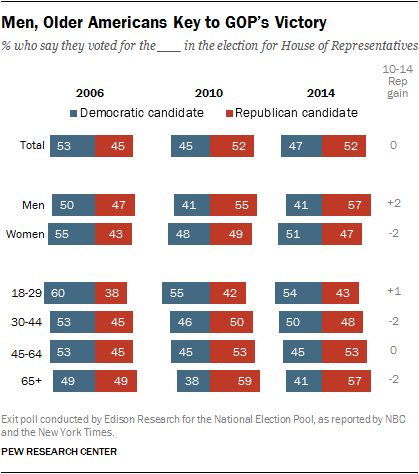 This gap is the result both of the youngest voters (18- to 29- year-olds) consistently favoring Democrats over Republicans, while over this same time period voters 65 and older have consistently favored Republicans. Before 2004, there were little to no age differences in vote preferences going back more than two decades. And the gender gap in elections is at least as wide today as at any point over the last 15 years. Women were ten points less likely than men to support Republicans in yesterday’s election. That gap was eight points in 2012, six points in 2010, five points in 2008 and four points in 2006. Note: The demographic composition of the electorate according to exit polls may result in slightly different estimates than final figures produced by the Census Bureau’s Current Population Survey in the coming months. Still, the comparisons across exit polls over time provide a useful window into the electorate’s composition across elections. This post has been updated based on a revised weighting of the National Election Pool’s national exit poll as published by NBC News as of 1:30 p.m. on Nov. 5, 2014. If data are subsequently re-weighted by the National Election Pool (NEP), the consortium of news organizations that conducts the exit polls, the numbers reported here may differ slightly from figures accessible through the websites of NEP member organizations.